Black is by no means obliged to accept the gift. The range of replies is really wide (8...c5, 8...Bb7, etc. ); one could expect from Leko the simplifying 8...Ne4!?. However, the Hungarian decided to go the most ambitious way and accepted the challenge. For a dozen of moves, Black was doing fine, but then his mistakes started to come one by one. Black has a good positional compensation (and a pawn) for the exchange. 19...Ne4?! (probably a miscalculation; 19...Qf5!) 20.f4! Nxd2 21.fxe5 Nf3+ 22.Kf2 Nxe5 23.Rag1! Bh5. The endgame after 23...Rd8!? 24.Rxg4 Rd2+ 25.Kf1 Nxg4 26.Rxg4 Rxb2 27.Rg2 Rb4 is slightly better for White. 24.Rxg7+ Kh8 25.R7g2! Rd8 26.e4 c4?! (a prelude to the decisive mistake) 27.Nd5! (White is already seriously better) 27...Bf3? Boris Gelfand has scored his first victory in the tournament. Probably the 12th move by his opponent Alexander Morozevich was a mistake allowing a nice positional piece sacrifice. In compensation for a knight, White has got a pair of powerful connected passed pawns, which is more than enough given the extreme awkwardness of Black's queenside pieces. Gelfand went on to win in 41 moves; Black's counter-attacking resources on the kind side have proved to be unsufficient. Vladimir Kramnik has saved an unpleasant position again Levon Aronian who's move 37 was a mistake allowing Black to solve his problems quickly. The game Inarkiev - Ding Liren was a calm draw; the Russian GM deviated from main lines in the Caro-Kann Defence and derived nothing special from the opening. 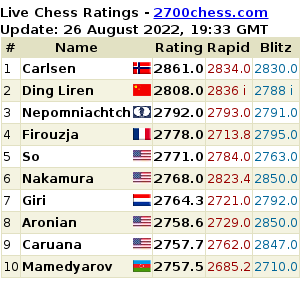 Thus, Alexander Grischuk has 4.5 points out of 5 and is one point and a half (!) ahead of his nearest rival Vladimir Kramnik, which means he needs to get only a point in the last two rounds to secure clear first place. 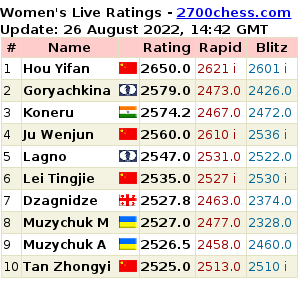 The key pairings of the 6th round are Aronian - Grischuk and Kramnik - Morozevich. The TASHIR supertournament in memory of Tigran Petrosian has been opened in a grand manner on November 3rd in the Novotel Moscow City hotel. An opening ceremony of the Tigran Petrosian Memorial will commence today at 19:00 MSK (16:00 GMT) in the Novotel Moscow City hotel. The tournament is organized by the Russian Chess Federation and sponsored by Tashir group of companies; the chairman of the organizing committee is President of Armenia Serzh Sargsyan who is President of Armenian chess federation as well.